TwoMorrows’ Harvey Award nomination for ACBC: The 1950s! 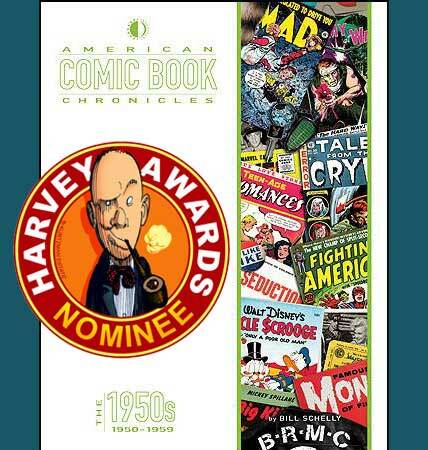 We were pleased as punch to discover that our book American Comic Book Chronicles: The 1950s (written by Bill Schelly, and edited by Keith Dallas), was nominated in the 2014 Harvey Awards for “Best Biographical, Historical or Journalistic Presentation.” Kudos to Bill for the stellar job he did researching and authoring this landmark look at a notoriously under-explored era of comics history (and to Keith for the wonderful work as editor of the series, and author of the 1980s volume). To date, we’ve got volumes covering from the 1950s to the 1980s, including our new 1970s volume, which is on the way back from the printer, and should be shipping in just a couple more weeks. This entry was posted in TNT on 14 August 2014 by Mr. Morrow.